Again Święta Lipka (German name: Heiligelinde). Always associated with Reszel and two neighbors buried there (that is another story yet to be told 😉 ). Also associated with Matthias Johannes Meyer and his incredible talent. And last but not least – associated with safety and security at work. Because Matthias Meyer fell from scaffolding while working in July 1737. This was a lethal accident. Therefore, Warmia, or should I say the whole Polish Kingdom lost an extremely talented painter. Matthias was born in Lidzbark Warmiński – the capital of the Warmia (Ermland) bishopric. Warmia was lucky to have enlightened rulers and rich ones too… No wonder then that patronage flourished. So this also was the case with the young Meyer. He was noticed by Bishop Teodor Potocki. While describing the bishop we often add that he was a “fanatic” but it must be admitted that in his time very much has happened in the Episcopal principality. A lot when it comes to renovations, and foundations. Bishop Potocki was responsible, inter alia, for creation of the full of elegance and beauty church in Krosno (near Orneta), also for extension of the founding in Stoczek Klasztorny. 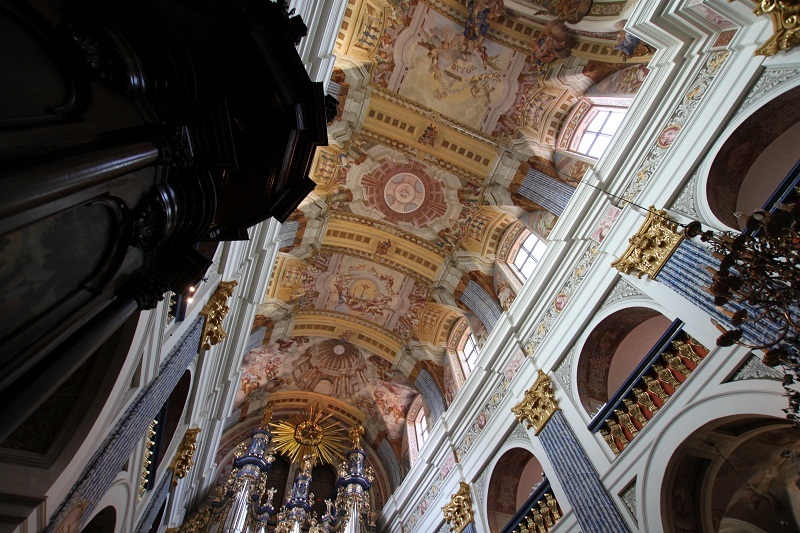 But coming back to Matthias Meyer – Bishop Potocki noticed the young painter working in the nearby parish church. The youngster was talented whereas he lacked the refined line… Therefore the Bishop sent him to Italy to learn more. In 1722 the fully educated young painter began work on decoration of the renewed (or may be should be – modernized) Church in Święta Lipka (Heiligelinde). 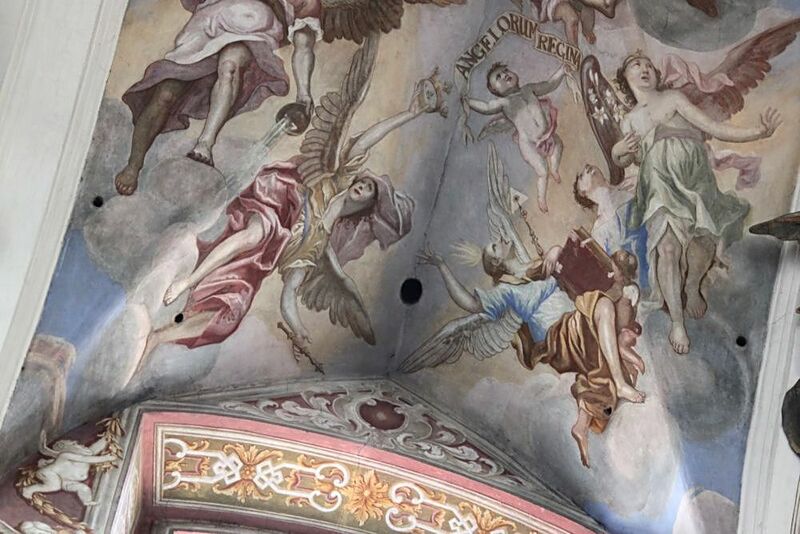 Mayer introduced to the Polish art quadratura (that is illusionist painting that mimics the architecture) in the decoration of the vaults, has also introduced a panoramic decoration (figural). We know (or we can rather guess) how the artist looked like because in two places in the shrine he left us his self-portrait. 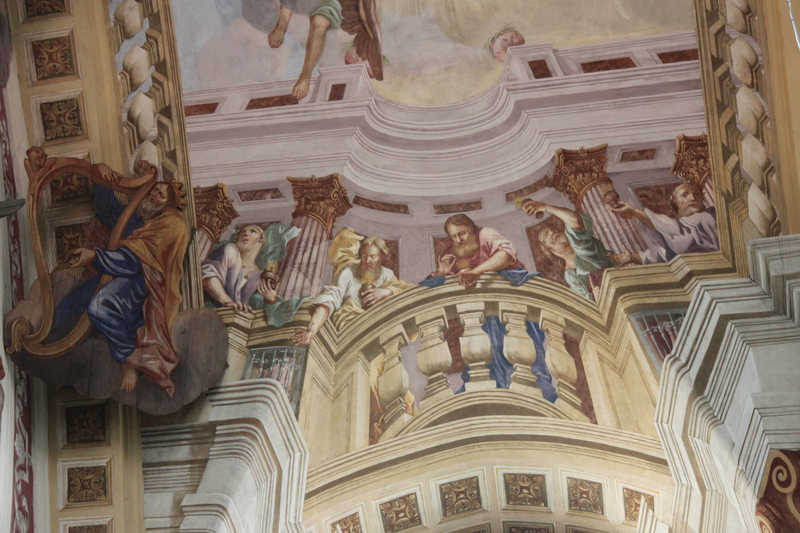 One in a vaulted ceiling in the corner over the organ, and the second in the picture “Christ teaches in the temple”. But Heiligelinde it not all that Matthias left us. We’ll meet him in the chapel of St. Bruno in Wozławki (German Wusslack) near Bisztynek (German: Bischofstein). There he worked on the order of Gottfried Heinrich Zu Eulenburg of Gallingen (then the pastor at Wozławki). We will meet him also in Frombork, where he ​​painted the chapel of Salvator (Savior). Above the entrance to this magnificent chapel, he left his signature. Teodor Potocki has not forgotten about his protégé. Once he became Primate of Poland, he ordered Meyer to paint of his funerary chapel in the cathedral of Gniezno. Besides the murals he painted oil paintings too. But these are rarities today, and one such is in the Museum of Warmia and Mazury in Olsztyn. The last works of Meyer were performed in the Święta Lipka (Heiligelinde) church in the years 1733-1937. 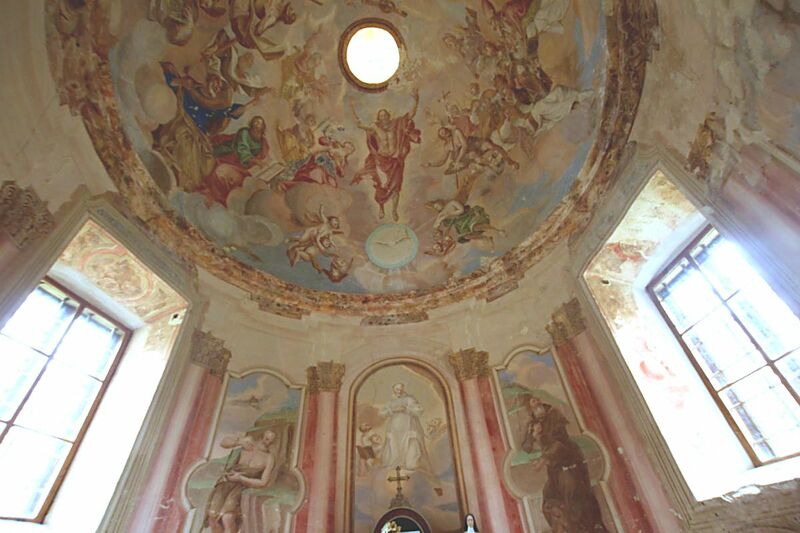 And those were paintings on the ceiling and walls in the northern part of the church cloister. They are, as experts say, the most mature of his work. Unfortunately, they remain unfinished. Well, in July 1737 Matt Meyer painted on the ceilings of the cloister. For convenience he lay on the scaffold. The theme of the painting was the fight between the Angel and the Devil. It was then that the terrible accident happened. The painter had fallen from scaffolding. For few days he struggled with death, but unfortunately he lost the combat. Because he was so much connected with Święta Lipka, and spent there so many years, he was buried in a crypt under the church floor. And for his “trip from Here to Eternity” he was given his attributes … 3 brushes, with which he almost never parted. Undoubtedly, he was A Someone on the artistic map of the eighteenth-century Polish Kingdom. And to conclude this essay, again I have to state I was lucky, to hear an organ recital. I did not call the parish prior to the visit, mindful of the incredible luck that accompanies me there. Namely – every time (I mean the off-season) I visit the Sanctuary I am lucky to hear the mini concert. And so it was this time. I put a sample of the recital HERE to listen to Bach and look at the brilliant paintings by Matthias Johann Meyer.